Optimal treatment of your foot and ankle issues often requires the use of specialty products and services. It is the goal at our practice to provide you with anything and everything you may need in one convenient location. As such, we are proud to introduce you to The SHOP at Dallas Podiatry Works! We now have gift certificates. Just call one of our office for details and to purchase! You already know we provide first-class treatment for our patients in the Metroplex communities, but foot care doesn’t stop the minute you walk out the front door! In fact, it can start even beforeyou walk in our doors for the first time, as no appointment is necessary to shop at The SHOP! Depending on the condition we treated, you might need to follow a particular plan to keep your feet on the road to recovery or at their peak levels of health and functionality. This may entail activities like a stretching program or following a particular icing routine. In some cases, though, you benefit from special products, and that’s where The SHOP can help. Nail Care Products – After your laser treatment to clear up fungal toenails, you will want the best, top of the line, nail care products to keep them clear of issues, and we are glad to help. Medical & Spa Quality Skin Care Products – We carry products to help keep your toes and feet moisturized, comfortable, and healthy throughout the year. Wound Healing Products – Your health is always our primary concern here at Dallas Podiatry Works, so we found the right products to promote healing and continued treatment. Specialty Hosiery – Those diabetic socks we mentioned earlier? Save the money on gas by making a one-stop trip here at The Shop! Supportive Shoes, Slippers & Sandals – Most sandals provide awful support for your feet. Those aren’t the ones we stock. What we do have are fashionable, supportive sandals, slippers, and shoes that feel good, look good, and provide healthful support to keep your feet in shape. Diabetic Footwear – Given the strong connection between diabetes and foot health, there was no way we would put together a shop without offering quality, durable footwear to keep you safe. Post-Surgery Care Products – Once the surgery is over, your body still needs to heal and these products support that. Supplements & Vitamins for Nails – Dr. Joel W. Brook, Dr. David R. Northcutt, Dr. Irene Arroyo and Dr. John Baca have all selected these as the best to strengthen your nails and maintain vital nail health. 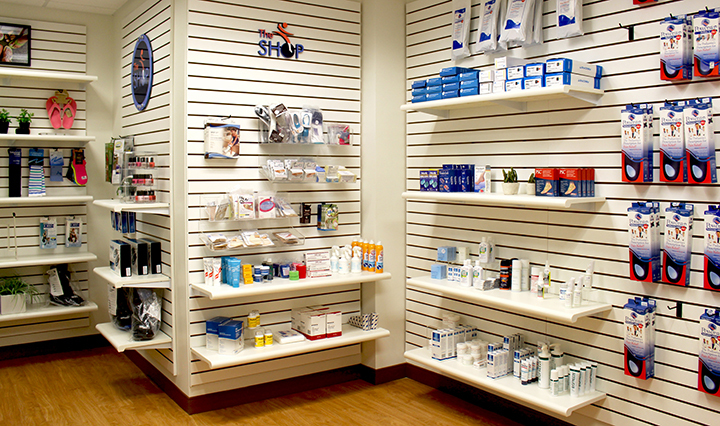 Note, all of the products can also be purchased at our Medical City Dallas office. Your time is valuable to you, which means it’s important to us. Sure, you could spend all sorts of time running around town, tracking down recommended products to keep your feet healthy and safe, but that sounds terrible. So what we did is track everything down for you and put them together in a single, convenient location – The SHOP! You can certainly use The SHOP to find the high-quality products you need following your appointment with us, but this is also a great place to find gifts for family and friends that show you care. Loved ones who suffer from conditions like diabetes or recently had surgery truly appreciate thoughtful gifts. You will find a range of leading-edge podiatry products to support their recovery and promote healthy lifestyles. Now that you know more about this service for you here at Dallas Podiatry Works, feel free to stop by during our normal business hours. Swing by our Plano, TX location and find the right products for you and your loved ones. If you need recommendations or suggestions, we are always happy to help you decide which products will be best for your individual needs! The SHOP is open Monday, Wednesday, and Friday from 8:00am – 5:00pm and Tuesday and Thursday from 8:00am – 12:00pm. If you are unable to visit The Shop at Dallas Podiatry Works Plano, TX location, the products are also available for purchase at our Medical City Dallas Office. For more information, simply call us toll-free at 972.566.7474.